As a child, Edward Murphy used to walk through the muddy construction site of the Cathedral of Learning on his way to Schenley Theater — the current site of Hillman Library — with his younger brother to watch movies. Murphy often wondered what the inside of the structure would look like, but he didn’t find out until he attended Pitt some years later. Murphy, 99, attended Pitt from 1938 to 1941. After a four-year break to serve as an aviation machinist in the Navy during World War II, he returned to finish his business degree in 1946. When he finally entered the Cathedral of Learning as a student in the fall of 1938, Murphy was extremely impressed by the building. The arches are a common characteristic of the Gothic style, which Charles Klauder — the architect of the Cathedral of Learning — used in the design of the building. Robert Alberts — who earned his B.A. and masters from Pitt in 1931— writes in his book, “Pitt: the Story of the University of Pittsburgh, 1787-1987,” that Klauder designed the Cathedral in this style because it was the “only architectural style designed for verticality and upward thrust,” and it was adaptable to tall buildings. According to Alberts’ book, construction of the Cathedral began September 27, 1926. Chancellor John Gabbert Bowman — who served as the tenth chancellor of Pitt from 1921-1945 — laid the cornerstone in the Commons Room June 4, 1937, and just two days later, 6,200 people visited the Cathedral for an open house. During the building period, the University delayed construction on the Cathedral numerous times. Chancellor Bowman and his design faced opposition from trustees and influential members of the Pittsburgh community. “We are building the Cathedral for all time. We hope it will be the outstanding landmark of the city for centuries,” Bowman is quoted in Alberts’ book. 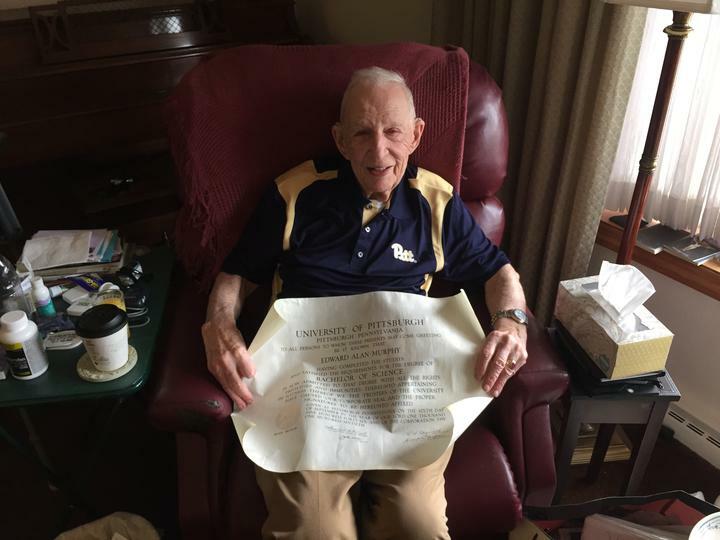 McDonald Williams, 99, who grew up in a community surrounding the city and attended Pitt from 1934 to 1939, said he remembers the University collecting donations from Pittsburgh communities to build the Cathedral. “As a grade school student giving nickels and dimes, I never thought I’d end up being a student there,” Williams said. Williams earned his B.A. in education from Pitt in 1939, as well as his master’s degree in English in 1942. As one of about seven African-American students in his graduating class of roughly 700, Williams said the social lives of minority students often involved joining a fraternity or sorority. Williams was a member of the Alpha Phi Alpha fraternity at Pitt. Aside from events held by his fraternity, he spent most of his available social time in the Cathedral’s Commons Room. Williams said his fondest memories of the building were the afternoon teas held in the Commons Room around noon on Wednesdays. Williams said many couples went on dates to the afternoon teas, or students used it as a time to socialize with peers. Murphy recalled a majority of his classes taking place in the building. He said he especially enjoyed his first-year English class, which he believes greatly prepared him for his future career negotiating contracts for Westinghouse Electric in Pittsburgh. His professor, Dr. Charles Crow, became a distinguished member of the English department at Pitt. “Charles Crow Chair” is now a title given to a professor of the English department — named in honor of Murphy’s professor — who has earned distinction as a scholar and is recognized for outstanding engagement with students. Murphy stayed in the Pittsburgh area after graduation and has returned to Pitt’s campus many times since. Aside from a few new buildings constructed, he said the essential character of the campus remains the same. He was a left halfback on Pitt’s football team in 1940 and 1941. When Murphy had children, he said he wanted to get them involved in football as well, so he bought season tickets for Panthers football. He has been a season ticket holder for both football and men’s basketball since the 1960s, and attended games up until last year. A nerve problem in his back has made attending these events more difficult, even with the assistance of a cane. Williams’ life took a different course after graduation, as he left Pittsburgh and started his teaching career at age 24. He earned his Ph.D. in Victorian English from Ohio State University and eventually went to work in the English Department at Tennessee State University. He was the director of the honors program there for 22 years but now calls Atlanta, Georgia, his home. Williams returned to Pitt in 1989 to attend his 50th reunion. 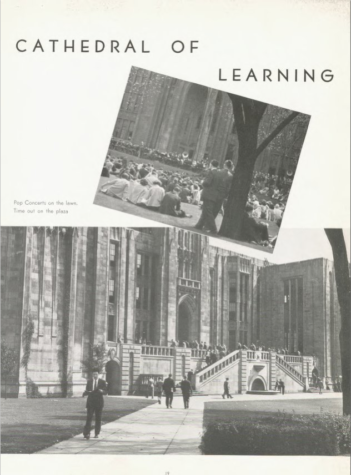 Both Murphy and Williams said the Cathedral of Learning was a symbol of the University in its early years, just as it is today. Murphy said the Cathedral was, and still is, a symbol of aspiration and excellence. Even today, the Cathedral doesn’t fail to impress students. Caitlin Thornburgh — a current graduate student studying social work — said she loves coming to the Cathedral to study because she thinks it is inspiring and helps her focus. Murphy said he always wanted to see the view from the top floor of the Cathedral, but he never happened to make it up there.